Dr. Stephanie Kayden had just returned to the emergency room, after grabbing a slice of quiche in the hospital cafeteria. A resident pulled aside the senior doctor to discuss a pregnant woman who was vomiting. It was strangely serene for Marathon Monday. A nurse hurried over and confirmed that the city’s ambulance control center had reports of explosions near the finish line. There were no details. But there was enough. Kayden, 38, who oversaw a field hospital after the Haiti earthquake, and her colleagues began clearing the Brigham and Women’s Hospital emergency room, moving patients into rooms upstairs or sending them home. Then the dispatcher blurted a second chilling message: Two adult victims, and a child with a brain injury were on their way. That’s when Kayden knew it was serious — the Brigham rarely gets pediatric trauma victims. At 3:08 p.m., emergency crews wheeled in a blond toddler, alone, squirming on an adult-sized stretcher, crying and struggling to get up. Officials issued statements firmly denying widespread media reports that a suspect was in custody, although they said they are “very close” in the investigation. At trauma centers across the city Monday, doctors and nurses were pulled from treating routine chest pain and twisted ankles. Hospitals put in place long-rehearsed emergency plans, summoning help from across their campuses, and paging off-duty staff. Dozens of caregivers, including some unable to finish running the Marathon, simply showed up. Hospitals prepare for mass disasters, for dirty bombs, subway crashes, downed airplanes. Many ER physicians have treated wounded soldiers in Iraq and Afghanistan. So everyone knew where to go, what to do. Staff at Boston Children’s Hospital donned masks and yellow gowns meant to protect against biohazards, and, because so little of their faces were exposed, attached colored stickers with their titles: Attending surgeon. Social worker. Respiratory specialist. As first responders loaded patients into ambulances on Boylston Street, four teams gathered around empty beds in the emergency department. Then they waited. James Hooley, chief of Boston Emergency Medical Services, said 90 patients were transported by ambulance in one hour. Those with the most critical injuries — internal bleeding that might kill them within 20 minutes – were given priority status and taken first. At the Brigham, pediatricians dashed from the neonatal intensive care unit to treat the little boy. Five minutes later, the hospital’s second patient arrived — a thin young man sitting on a stretcher, awake and talking, but dazed. Several police officers accompanied him. Kayden was surprised to see him among the first patients, because he did not appear seriously injured. But soot and singed hairs around his nose raised the possibility that his airways were burned. As doctors snaked a special camera down his throat, FBI agents came to question him . Then, a third patient arrived. “I turned around and looked and it was scary. I knew he was going to need a lot of help,’’ Kayden said. The man was carried in a “bucket stretcher” — a kind of basket. His right leg was shredded where it had been blown off below the knee. A large blast wound had opened on his left thigh, and emergency medical technicians believed his car keys had become imbedded inside. He was awake. Soon, about 40 law enforcement personnel swarmed the ER, asking patients to recall any details from the scene. Doctors and nurses ran and yelled for supplies and help. Across the street at Children’s Hospital, doctors and nurses treated more horribly injured patients. The first two children, a 9-year-old girl and a 10-year-old boy, arrived covered in soot. Their hair was singed, their bodies dotted with shrapnel, and their legs tied with tourniquets, said Dr. David Mooney, a surgeon and director of the trauma program. Staff members took their assigned places around their beds as a surgical resident scanned the patients from head to toe, announcing the injuries. When he noticed a colleague looked nervous and was talking loudly, Mooney issued a reminder: We’re doing fine. Do the drill. Focus on the routine. The boy and the girl, who lost a leg, were sent to operating rooms, and likely will need further surgeries, Mooney said. As the minutes sped by, emergency room staff and trauma surgeons came to an awful realization: Some of the metal objects removed from patients’ bodies and seen embedded on X-rays were not random street debris. They were nails and round metal pellets — objects stuffed inside the bombs to inflict maximum injuries. At Tufts, as doctors evaluated the first group of four patients about 3:30 p.m., law enforcement officials made a request: They wanted “any foreign bodies removed from wounds to be saved, catalogued with the patient’s name, and then turned over to them,” Mackey said. By 4:30, the number of patients had slowed to a trickle. 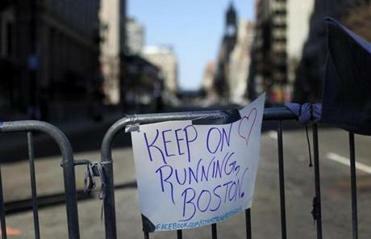 Boston’s hospitals would treat 158 people for injuries suffered in the explosions on Monday. Surgeries — amputations, scraping away of dead tissue, cleaning out dirt and debris — went late into the night. The last surgery ended about 11:20 p.m.
Back at the Brigham, Kayden’s husband had texted shortly after 3:30: “Hi. Are you okay?” She hadn’t had time to respond. At 7:30, she called home and got voicemail.